Blueair ha annunciato al Paris Air Show un ordine fermo di 6 nuovi Boeing 737 MAX 8, più un’opzione di 2 aggiuntivi. Inoltre Blueair ha siglato un accordo con ALC, società californiana di leasing aeronautico, per l’ingresso di 12 macchine in flotta: 6 Boeing 737-800 NG ex-Pegasus, e 6 nuovi 737 MAX 8 che verranno consegnati a partire dal 2019: in totale quindi 20 nuovi aeromobili! Queste macchine sosterranno la crescita ed il rinnovamento della flotta Blueair, oggi a quota 30 macchine con l’obiettivo di salire a 50 macchine entro il 2020, di cui un numero importante sarà posizionato sulla base di Torino. Il tassello principale è sicuramente la scelta del 737 Max 8, il vero sostituto del 737-800, la cui configurazione a classe unica può arrivare a 200 passeggeri. Oggi la base di Caselle è costituita da soli 737 Classic (serie -400 e -500), mentre i voli operati dalle basi in Romania a Caselle sono operati con Boeing 737-800: ci aspettiamo che con questa evoluzione di flotta anche a Torino avremo presto gli -800 in night stop, macchine che potrebbero essere impiegate sulle rotte più trafficate. LOS ANGELES, June 20, 2017 — Today Air Lease Corporation (NYSE:AL) announced the placement of six (6) new Boeing 737 MAX 8 and six (6) used 737-800 aircraft on long-term leases to Blue Air (Romania). The 737-800 aircraft, which ALC acquired from Pegasus Airlines, began delivering in May 2017 and will continue through Q4 2017. The new 737 MAX 8 aircraft are scheduled for delivery between mid-2019 and Q1 2021, from ALC’s order book with Boeing. “We are pleased to announce this strategic lease placement with Blue Air, a new customer for ALC. We look forward to a successful long term relationship with Blue Air as it continues to modernize its fleet in order to offer superior services and cost efficiencies that are passed on to their customers,” said Marc Baer, Executive Vice President of Air Lease Corporation. “This new lease agreement is a great opportunity to develop and grow our relations with Air Lease Corporation as a strategic partner sustaining our ambitious development plans. 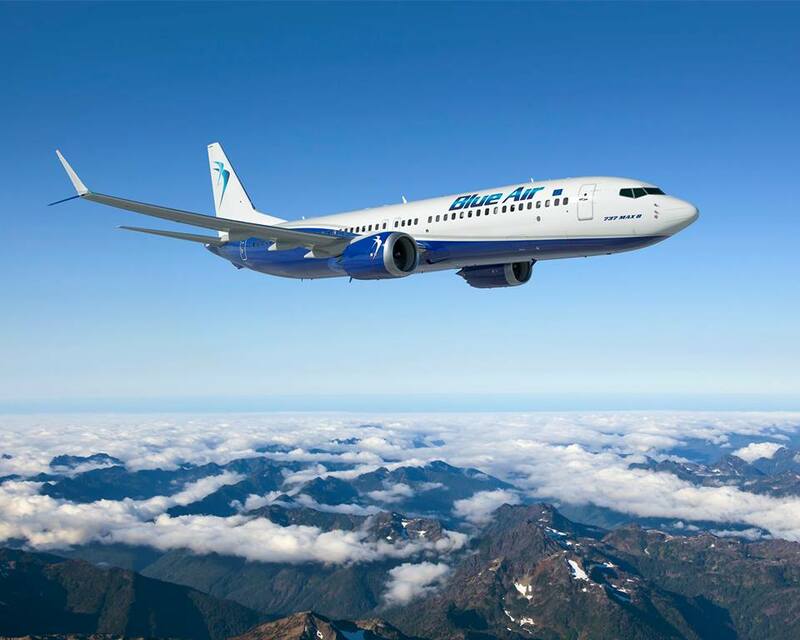 Adopting the brand new 737 MAX family is an important milestone for Blue Air and the Romania aviation sector, allowing us to further improve our operating efficiencies,” said Gheorghe Racaru, Chief Executive Officer of Blue Air. “During the past several weeks, Blue Air has already taken delivery of three of the six Boeing 737-800s from ALC and has placed them into their flight operations for their 2017 summer schedule,” said Steven F. Udvar-Hazy, Executive Chairman of Air Lease Corporation. ALC is an aircraft leasing company based in Los Angeles, California that has airline customers throughout the world. ALC and its team of dedicated and experienced professionals are principally engaged in purchasing commercial aircraft and leasing them to its airline customers worldwide through customized aircraft leasing and financing solutions. For more information, visit ALC’s website at www.airleasecorp.com. As Romania’s leading Airline Company, Blue Air was founded in Bucharest in 2004 and developed throughout the years to become a pan European Smart Flying operator with bases in Romania, Italy, United Kingdom and Cyprus. Since 2016, it has become the largest Romanian airline by scheduled passengers flown, operating flights to more than 100 destinations in 16 countries. The Smart Flying model provide superior passenger satisfaction through proven safe operations, reliable wide network schedule, and a customer centric approach offering our guests an affordable and friendly experience.